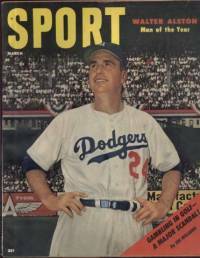 I acquired a complete set of SPORT Magazine from 1956 at the time that this page was created. 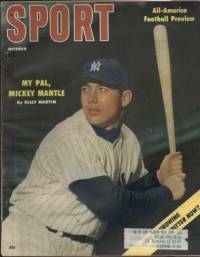 The bulk of this page is a detailed examination of the contents of these twelve issues from SPORT Magazine’s tenth year of existence. These descriptions are intended to give you a clear picture of what SPORT was publishing at the time. SPORT Magazine – January 1956. Is the Fight Mob Scared? What Are Your Chances of Making a Living in Sports? They’ve Got to Change the Bonus Rule! SPORT Magazine – February 1956. 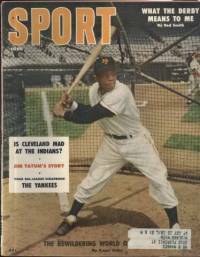 Cover: Features a large photo of Sihugo Green with smaller pics along the left border of Rocky Marciano, Leo LaBine and Mickey Mantle. Is Si Greene the Last of the Great Dukes? Plus regular features and a Camel Cigarettes ad featuring actor Brian Keith on the back cover. 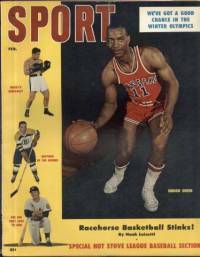 SPORT Magazine – March 1956. Plus all regular features and a Camel Cigarettes ad featuring Brian Keith, Rise Stevens and three others on the back cover. SPORT Magazine – April 1956. SPORT Magazine – May 1956. Plus all regular features and a Camel Cigarettes ad featuring Rock Hudson on the back cover. 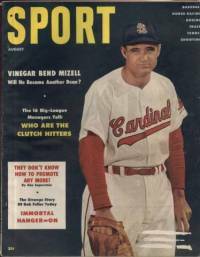 SPORT Magazine – June 1956. Say Isn’t That Willie Pep in There? 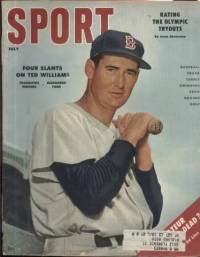 Also includes 2/3-page ads for baseball gloves inside, one with Ted Williams for Wilson and the other with Willie Mays for McGregor. 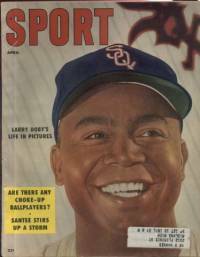 SPORT Magazine – July 1956. 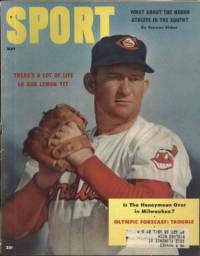 Plus all regular features and a Camel Cigarettes ad on the back cover featuring small pics of 16 baseball stars pitching Camels–stars include Kluszewski, Hank Bauer, Richie Ashburn, Warren Spahn, Yogi Berra, Jackie Jenson and many others. 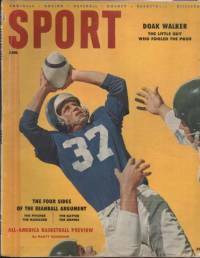 SPORT Magazine – August 1956. Plus all regular features and a Camel Cigarettes ad featuring Phil Silvers as Sgt. Bilko on the back cover. 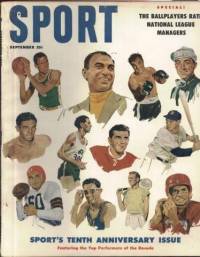 SPORT Magazine – September 1956. Ten Moments to Remember with a page on each of them: 1946-The Army-Notre Dame Draw; 1947-Jackie Robinson Makes the Majors; 1948-The Kid from Tulare Wins (Bob Mathias); 1949-Joe DiMaggio Returns to the Line-up; 1950-Ben Hogan’s Comeback; 1951-The Home Run (Bobby Thomson); 1952-…And New Champion Rocky Marciano; 1953-The Dancer Was Late (Native Dancer); 1954-The Four-Minute Mile (Roger Bannister); 1955-The Dodgers Win! 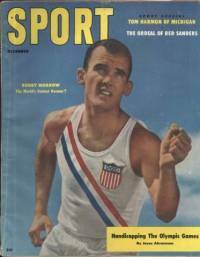 SPORT Magazine – October 1956. Are They Still Throwing the Spitter? Can Althea Gibson Make It? SPORT Magazine – November 1956. 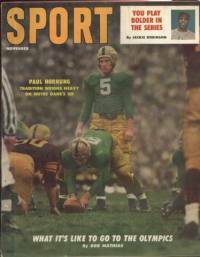 Cover: Paul Hornung of Notre Dame with a smaller picture of Jackie Robinson in the top right corner. SPORT Magazine – December 1956.